We clean a wide variety of carpet of all different types with no stretching or shrinking. With every clean you receive Free Odor Neutralizer & Anti Resoil Formula. Carpeted areas will be thoroughly vacuumed first with a hepa filtered extractor vacuum. Vacuuming removes the dry soil that has bonded to your carpet. Removing this dry soil is one of the most important steps in cleaning your carpet. Traffic areas and spots are pretreated. This pretreatment is a special environmentally friendly solution that helps break up the dirt and soil attached to your carpet. 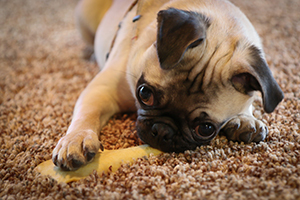 Your carpet will be pre-groomed with a carpet groomer to further loose traffic area soil. This advanced method ensures your carpets are cleaned to the base of the fiber, without over-wetting. We will check for spots that did not come out during the normal cleaning process and use different spotting solutions to try and remove those spots. We love our pets but….they can create offensive odors and leave our carpets and upholstery looking unsightly. We can clean and transform your area rugs into looking like new again, restoring colours and fibres. Our Green Seal Certified cleansers eliminate stains and odors and leave your carpets and upholstery clean and healthy with NO Toxic chemicals. It is one thing to remove stains, but if toxic chemicals are used to achieve this, you may be causing yourself, cat or dog to suffer with long-term health issues. Remember our pets are very sensitive to the smell of toxic air-born products or if they are walking or lying on carpets with unhealthy cleaning residue left on the carpet fibers this is also not good. Carpets play a big role in the perception of your office space. Project a professional image and, ensure your work environment is healthy for your workers. We understand you don’t have time to deal with wet carpets, and you don’t want an office with lingering chemical odors left behind by other carpet cleaning methods. 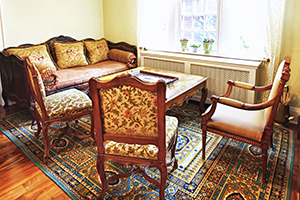 Contact Green Space Services and discover the benefits of OUR carpet cleaning system. We can clean your carpets quickly and effectively – and you will be able to walk on your carpets immediately, so it will be business as usual. Call 250-682-1066 for your FREE, no-obligation quote today. Certified carpet cleaning with Green Space Services is your answer. We have Certified Advanced Air Cell Technology products designed to give deep cleaning results no matter what type of carpet. No stretching or fading. For more info on how other hospitality players: hotels, casinos, theatres, airports, conference centres call Green Space Services for your FREE, no-obligation quote 250-682-1066.